No, it’s not a normal hotel room… our rooms are real Safari accommodations with comfort. It’s perfect if you stay here a few days extra to relax before, between or after your Safari Game Drive. Also many guests come here without doing any Safari Game Drive, but only for relaxing and enjoying the perfect climate and nature. But… we are in the middle of the most famous National Parks in Tanzania, so it’s only a short distance and you are between the Big-5, so let us advice you in our information centre about all excursions and Safaris. We have daily departures and a safari Jeep available for all our guests. Private location and best view to Lake Manyara. Ground floor and detached tent, garden view, single beds, shared bathroom facilities. Super location between all the parks! 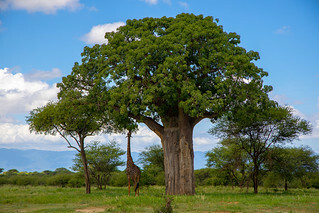 The campsite’s location is unique because it is located between the most important safari parks in northern Tanzania. It’s a perfect base for visiting the Serengeti, Ngorongoro Crater, Tarangire, Arusha National Park, Lake Manyara, Lake Eyasi and Lake Natron. Only 1 km from NP lake Manyara, 20 km from Tarangire, 20 km from Ngorongoro, 80 km from Serengeti and 110 from Lake Natron. It’s located in a micro climate zone, the temperature is very comfortable and it rains very little, much better than, for example, Arusha or Karatu. We arrived at this camp and found that our agent had booked “bell tents” for us. This came as a bit of a shock to us as we had been unaware of what bell tents actually were. It was, literally, just a small tent with a couple of camp cots! I guess that would be fine for those who are looking for that kind of accommodation…. To the credit of the manager, Tim, and his efficient assistant, Lovenia, they were able to accommodate us in the “luxury tents”. This tent is absolutely superb and lives up to its name. It is fully equipped and almost comparable to a decent hotel room. The rest of the staff — in the bar, dining area and the masais who do the other odd jobs around the camp are all extremely friendly, helpful and cooperative. The camp itself is beautifully laid out and has a wonderful feel of quiet comfort about it. There is even a bonfire area around which you can sit and interact with other guests. Over all, a wonderful experience and a camp I would highly recommend if you plan to stay in that area! Lake Manyara is a shallow lake in the Natron-Manyara-Balangida branch of the East African Rift in Manyara Region in Tanzania. Said by Ernest Hemingway to be the “loveliest [lake] … in Africa,” it is also the home of a diverse set of landscapes and wildlife. Lake Manyara provides opportunities for ornithologists keen on viewing and observing over 300 migratory birds, including flamingo, long-crested eagle, and grey-headed kingfisher. With an entrance gate that doubles as an exit, the trail of Lake Manyara National Park is effectively a loop that can be traversed by jeep within a few hours that may be stretched to a few more at best, if driving slowly, to watch, observe, and enjoy the diversity of flora and fauna. The Rift Valley escarpment forms a noteworthy landmark and provides a spectacular backdrop to Lake Manyara. To the east of Lake Manyara lies the Kwakuchinja wildlife corridor, which allows wildlife to migrate between dispersal areas and parks that include Tarangire National Park to the southeast, Lake Manyara to the west, and the Engaruka Basin to the north. Within the Kwakuchinja corridor are several villages that include Ol Tukai Village and Esilalei along the lakeshore. Lake Manyara is part of the Lake Manyara Biosphere Reserve, established in 1981 by UNESCO as part of its Man and the Biosphere Programme.